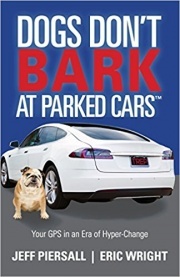 Dogs Don’t Bark at Parked Cars illustrates this encounter as the voices that find fault, who don’t think it’s possible, who are unable to see a future alive with opportunities waiting to be seized. They are the ones governed by fear instead of faith. Unfortunately, many times the loudest of these barking dogs are kenneled right in most people’s own heads. For Jeff and Eric, that priceless quality is wisdom. It goes beyond knowledge or aptitude and transcends this era of cultural and technological hyper-change, with principles that are timeless.